▶ INSTANT DELIVERY: US Stock; Local Shipment. ▶ 100% SATISFACTION GUARANTEE: 12-month Hassle-free Manufacturer's Warranty; Free Lifetime Technical Support. ▶ WHAT YOU GET: 1 x Magnetic Rod; 1 x Hand Pole; 2 x Wheels; 2 x Side Plates; 8 x Screws; 1 x Maunal. ▶ Material: High quality aluminum alloy, iron steel, magnet and plastic. ▶ Weight: 36''- 19.84lbs; 24''- 13.23lbs. ✔ STRONG MAGNETS: Heavy duty holding magnets can lift up to 30 LBS. Large working surface makes the clean-up more efficient with less effort. Made of high quality materials, ROVSUN's magnetic pick-up tool is built to last long. ✔ QUICK RELEASE: Just lift the quick-release handle may you remove all attached particles. Nails, screws and ferrous scraps can be collected quickly. 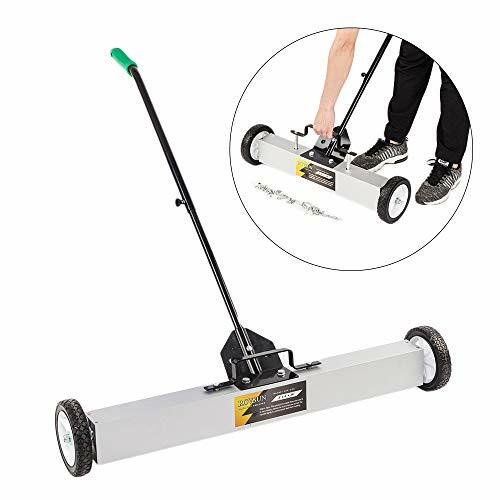 ✔ ALL-TERRAIN WHEELS: 7'' large wheels make the rolling smooth on grass, carpet and concrete floor. Ideal for industrial or home use in lawn, yard, warehouse and home depot etc. Keep your tires and foot safe from hurt. ✔ TELESCOPING HANDLE: Varies from 30'' to 46'' to meet different needs avoiding back-bending and straining. Ergonomic easy grip handle strengthen the comfort during working. ✔ 3 ADJUSTABLE HEIGHT: Three distance away from the ground - 0.6''/ 1.2''/ 2'' is available for different surface.